In 2004 I bought myself a modern copy of a Trapdoor Springfield in .45-70 calibre. I was pretty pleased with it as it was in as new condition and a great price. I fired it a couple of times with blackpowder handloads and being a bit of a chore to clean afterwards I decided to make up some smokeless rounds. Inherently, reloading ammunition is dangerous. The application of a little common sense will go a long way in keeping you out of trouble. There are a lot of people out there who take handloading for granted, they will tell you that all you have to do is resize the case, stick in a new primer, fill the case with powder then press in a bullet. In reality it is far from that simple. I looked down to see blood all over my left hand. Luckily I always wear leather gloves when I shoot. 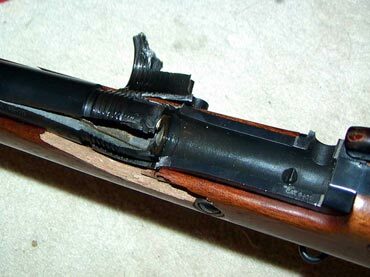 The barrel had a four-inch split in it and the top of the action had been completely blown off. A part of the chamber had gone in though my palm and out through the back of my thumb. The top of the action peeled off and squashed my fingers. All in all, a great lesson in what not to do. So now it is six weeks later. My palm healed quickly but the exit wound in my thumb has only just grown over. The powder manufacturers say that I grossly overloaded the rifle; they say that there is a note in the manual, which says that trapdoor loads have to be reduced to 30g. I can find no such mention anywhere. In any case the important learning is that reloading is a risky business and we should never take it for granted. · Follow loading recommendations exactly. · Don't substitute components for those listed. Start loading with the minimum powder charge in the loads shown. · Never exceed manufacturers' reloading data. Excess pressures caused by excessive loads could severely damage a firearm and cause serious injury or death. · Understand what you are doing and why it must be done in a specific way. Stay alert when reloading. Don't reload when distracted, disturbed or tired. · Set up a loading procedure and follow it. Don't vary your sequence of operations. · Set up your reloading bench where powder and primers will not be exposed to heat, sparks or flame. · DO NOT smoke while reloading. · ALWAYS wear safety glasses while reloading. · Keep everything out of the reach of children. · Keep your reloading bench clean and uncluttered. Label components and reloads for easy identification.